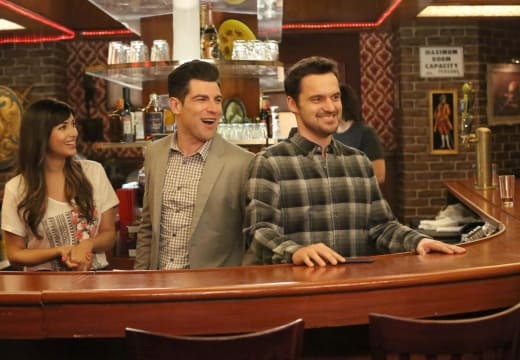 New Girl Season 5 Episode 2 Review: What About Fred? I really hope Winston was able to get that knot out of Ferguson's fur. On New Girl Season 5 Episode 2, Jess made a small attempt to get back into the dating world, but took a couple wrong turns along the way. I was a little nervous about an episode surrounding Jess getting back into the swing of things, but was pleasantly surprised by the results. Let's not waste anymore time and discuss, "What About Fred?" Nick, as manager of the bar, is exactly what I was expecting from him. I wasn't surprised he was trying to teach the bartender how to "professionally" slide a glass. This is Nick we're talking about. Schmidt really should have seen all of this coming. 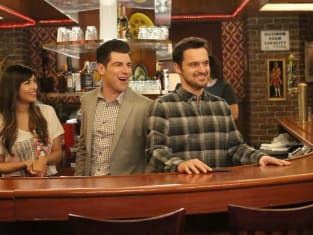 Schmidt has known Nick forever, and there's no way he didn't think of at least training Nick on the proper way to manage a bar. I couldn't help laughing at Nick trying to hold a staff meeting and assert his dominance in the group. At least he tried. I don't understand why Schmidt was even trying to change Nick. This has been done in the past with terrible results. When it comes to Nick and Schmidt's work ethics, Nick is more of the good cop, and Schmidt is the bad cop. They both really need to play to their strengths if the bar is going to survive. It honestly would make more sense if Nick was in charge of the staff and Schmidt was in charge of the paperwork. Nick still needs to learn how to be stern with the staff but also have them know he's on their side, as well. Then we have Jess and her adventures in the dating world. Of course she'd get stuck with a dud. Even though Fred's parents were awesome, I don't think I would have been able to stay with Fred for so long. The problem Jess has with her dating life is she's looking for the perfect relationship – it doesn't exist. It doesn't matter how much you have in common with someone, you're going to fight with them, and Jess still hasn't realized this. I hope someone comes along for Jess who is a great match, but there is no such thing as a perfect match, and I just don't see it happening anytime soon. The most important thing of note? Ferguson was back! I was beyond thrilled to see Winston talking to Ferguson while trying to get the knot out of his fur. The relationship between Winston and his cat is hysterical because it's how many people view their own animals. They really could structure an entire episode around Ferguson, and I think people would love it. Maybe the writers should look into doing an episode from only Ferguson's point of view – what the cat sees on a daily basis. In the end, things took an awkward turn when Fred's parents tried to persuade Jess to stay with Fred because she was the daughter they always wanted. After hearing Fred talk about trains, I don't blame his parents for wanting Jess to stay. How did they not fall asleep listening to him? Do you want to relive this episode? Go watch New Girl online now via TV Fanatic and get all the Ferguson goodness you can handle. Just make sure to come back to let us know what you think.